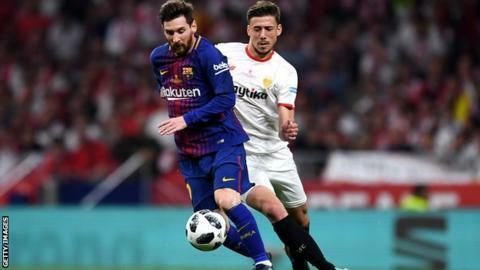 Barcelona have signed Sevilla centre-back Clement Lenglet for 35.9 million euros (£32m) and put a 300 million euro (£265m) release clause on him. Lenglet, 23, has signed a five-year deal at the Nou Camp after the Spanish champions met his buy-out clause. The French international joined Sevilla from Nancy in January 2017 and scored four goals in 52 games last season. Barcelona describe Lenglet as "one of the most promising defenders on the planet." Lenglet started in both Champions League last-16 ties against Manchester United last season, as Sevilla reached the quarter-finals. Barcelona say he "completes a spectacular defence" alongside fellow centre-backs Gerard Pique, Samuel Umtiti and Thomas Vermaelen.